The director of the Best Foreign Film Oscar winner IDA three years ago, Pawel Pawlikowski returns with a new film, dedicated to his parents (as stated at the end of the film) and based loosely on their lives. The film is set in Poland in the year 1949, just after the War. The film is a period love story. The film begins with several songs accompanied by various musical instruments played by assorted villagers. Director Pawlikowski slowly but surely brings the audience to the subject of his film. A musical scout is impressed with one rural dancer that begins a tempestuous romantic relationship that survives through time, trails and tribulations. 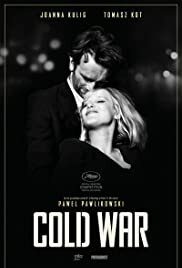 The film traces the remarkable journey of a troubled love relationship that survived the cold war. But the lovers endure a cold war of their own where nothing is black and white. What is black and white, however, is the film’s stunning cinematography (Director of Photography is Łukasz Żal), capturing the atmosphere of the period after the war where Poland indulged in popular propaganda. The exterior shots of the peasant farms and village amidst the trees and snow combined with the the interiors of the old buildings create the atmosphere. They travel together to different cities. She fails to show up when he decides to defect, while in Paris. They meet again at different times in different cities proving that their love is true – though plagued with jealousy. The intensity of the love is vividly portrayed by the two actors and the setting of the dance troupe (with some excellent dances) add a super backdrop to the story. Lots of metaphors in the film including the hilarious ‘pendulum that kills’ metaphor that got those watching the preview screening at TIFF (where I first saw the film) laughing. 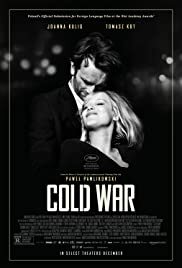 COLD WAR that premiered at Cannes last year has received universal acclaim. It competed for the Palme d’Or at the 2018 Cannes Film Festival, where Pawlikowski won the award for Best Director. Other awards include: the Golden Lions Award at the 43rd Gdynia Film Festival, five 2018 European Film Awards, and was selected as the Polish entry for the Best Foreign Language Film at the 91st Academy Awards, making the December shortlist. At the 72nd British Academy Film Awards the film earned four nominations, including Best Direction and Best Film Not in the English Language. The director of the Best Foreign Film Oscar winner IDA three years ago, Pawel Pawlikowski returns with a new film, dedicated to his parents (as state at the end of the film) and based loosely on their lives. The film traces is the remarkable journey of a troubled love relationship that survived the cold war. But the lovers endure a cold war of their own where nothing is black and white. What is black and whit, however, is the film’s stunning cinematography, capturing the years after the war where Poland indulged in popular propaganda. Wiktor (Tomasz Kot) the musical director of a dance tripe falls in love with a recruited rural dancer, Zula (Joanna Kulig). They travel together to different cities. She fails to show up when he decides to defect, while in Paris. They meet again at different times in different cities proving that their love is true – though plagued with jealousy. The intensity of the love is vividly portrayed by the two actors and the setting of the dance troupe (with some excellent dances) add a super backdrop to the story. Lots of metaphors in the film including the hilarious ‘pendulum that kills’ metaphor that got those watching the preview screening laughing.